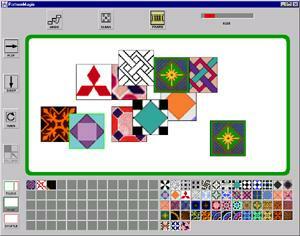 PatternMagix is a prototype of a learning environment for children. I developed it in Java during the summer of 1997 for MERL under the supervision of Carol Strohecker and Edith Ackermann. PatternMagix is one of a series of prototype environments in which learners experiment with part-whole relationships by composing objects and observing effects that emerge when the objects combine in a larger context. Such experimentation can support development of scientific understandings in the domain of multivariate systems. 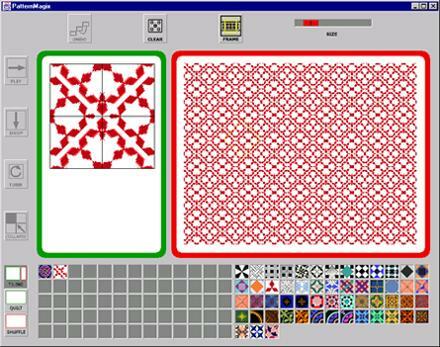 In PatternMagix, learners play in a world of colorful tiles and geometric operations, from which they create mosaic-like patterns. Interactions take the form of a dialog as learners use different modes of the dynamic interface. Play areas change size to reflect the dialogic turn-taking as constructions proceed. Color, animation, dynamic modeling, and interactivity are capabilities of current computational media that help in making tools for learning. Researchers take different approaches to the design, implementation, and evaluation of computational learning environments. MERL's approach follows a "learn by doing" philosophy. Like Dewey, Piaget, and Papert, we believe that learners construct their own knowledge, rather than absorbing what others present to them. We observe that learning happens particularly well when the learner is making something personally meaningful, which others can appreciate. Our aim is to provide tools for creation and appreciation in exploratory learning. The significance of the Magix series is in its interaction design. We model interactions as a conversation between the learner and the environment. In PatternMagix, each of these partners has a specific role in the construction of tiles and patterns, which are the parts and wholes of the geometric microworld. The balance of control plays out as working areas on the screen shrink and grow, affording the learner different tools and possibilities for interaction. 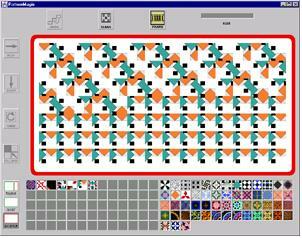 The learner composes tiles using basic geometric operations of symmetry and rotation, and Magix incorporates tiles within the larger context of a pattern. Magix also suggests areas of focus within patterns, which the learner can select and save for new compositions. 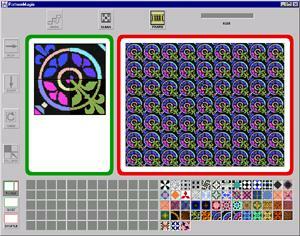 PatternMagix includes modes for creating, transforming, and animating tile-based patterns. Interactions are modeled as a dialog between child and system. As the child experiments by making tiles and spreading them into patterns, a kind of dance results. The Child Area (left) and System Area (right) expand and contract according to who is most active at a given moment. This alternation facilitates the constructive-dialogic style of interaction. The child can use several modes, functions, and geometric transformations to create colorful elements and intriguing patterns. ...so that many copies can fit within the System Area. Emergent effects become visible within the area. The system then "suggests" possibilities for new tiles. 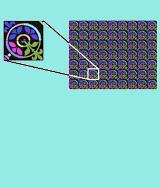 The child can manipulate the floating frame's position and select an area as the basis for a new tile. Different modes enable varying degrees of control as the child 'converses' with the system to create objects and patterns. Visit the MERL site for PatternMagix.